The CI Series is extremely versatile and suitable for the most specific applications, overhead demolition (demolition of complete iron structures), and demolition at ground level (in foundries, dumps, scrap yards). 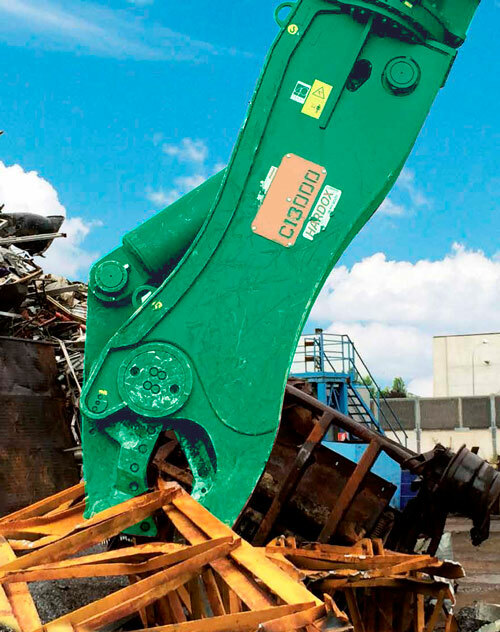 The CI Series Shears can be fitted on the excavator’s boom or on the excavator’s dipper. The body is made of Hardox 400 that guarantees safetyand reliability even in the most heavy-duty applications. The tip is made with 2 pieces for easier replacement and maintenance. Internal break system provides more resistance and longer life. “Trapezoidal” profile improves cutting ability and reduces stress on the shear. Blades are threaded for easy set up and replacement. Deep mouth and cutting angle increase the cutting performance, providing strong grip and easy release of the material. Innovative jaw adjustment kit allows to easily reduce and eliminate plays, giving a high cutting performance.